Rehabbing a two-family home was the perfect solution for a family of five. Michelle Hicks chops at one end of the kitchen island while her two younger kids, Cate and Matt, do homework. The lower cabinetry is painted Benjamin Moore Normandy; upper cabinets in Snowfall White match the trim and walls. 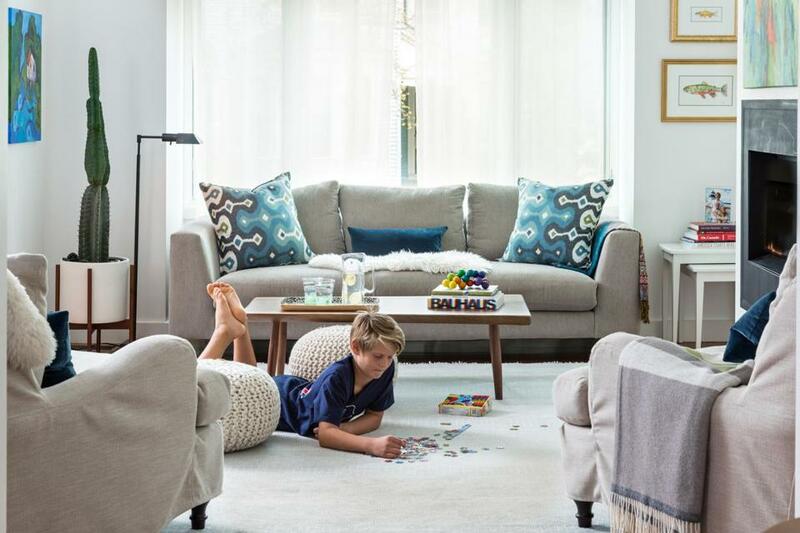 Knowing their family of five would at some point outgrow their Cambridgeport home, Michelle and Cam Hicks kept a careful eye on neighborhood real estate for close to three years. In 2010, they found just what they were looking for — a dilapidated two-family fixer-upper. Armed with a strong sense of style and solid ideas of how they wanted to live, the couple hired Newton-based architect Mary McKee, with whom they had worked in the past, along with Boston-based architect Rob Trumbour and Cambridge-based M.F. Keane Contracting. The team transformed the home, which had been virtually untouched for decades, from a dark, architecturally uninteresting box into an airy, functional family home with more than 3,900 square feet of sun-dappled space. Major renovations wrapped up in 2011, and smaller projects last year. McKee and Trumbour looked at layout first; their biggest concern was creating an open floor plan that would allow as much light as possible to penetrate the house. Step one was relocating the staircase from the middle of the building to one side, allowing the interior to breathe. 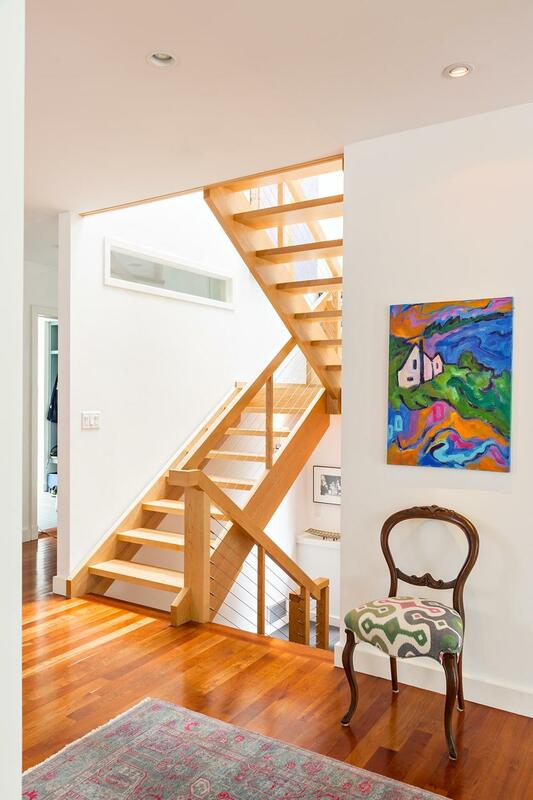 The new open-tread maple staircase with steel cable rails is the home’s architectural star. On the driveway side of the building, about 12 feet up from ground level, McKee and Trumbour designed a bump-out that shoots up through the roofline. The result (after a bit of back-and-forth with the zoning board) is an extra-tall, almost tower-like stairwell with oversize windows, a glass-block landing, and skylights. “It’s like a glass beacon that illuminates every floor,” says McKee. 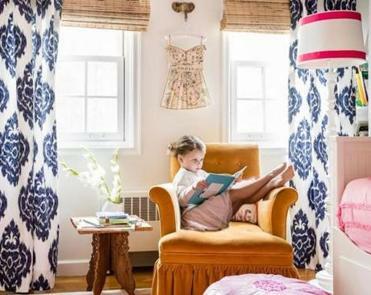 With a new floor plan giving them togetherness as well as privacy, sisters settle in to their redesigned bedrooms. The effect is simultaneously expansive and intimate. Newly enlarged windows open some rooms to the outdoors. Other areas, such as the den, which can be closed off with pocket doors, provide respite. In the living room, the sofa nestles in a niche and a gas fireplace keeps things cozy. “We’re neither on top of each other nor completely separated,” Michelle says. Just beyond, the dining area, furnished with mid-century modern pieces and inherited antiques, flows into the kitchen. At the homeowners’ request, McKee and Trumbour removed a three-season porch in favor of floor-to-ceiling doors that lead from the kitchen to a new back deck and patio. The family plays with their rescue dog, Digby, in the yard and sometimes sets up a screen for movie night. The kitchen mixes hard-edged lines with soothing color. The manufactured-stone countertop and backsplash were chosen for durability. The island, though partially the same material, is mostly constructed of ash. “Wood has a homier, more relaxed feel and will show some age,” Pinney says. Michelle says she loves the flexibility. Sometimes family dinner is at the dining table, where the kids also do homework. In nice weather, they eat on the deck, and on fish taco night, for instance, they put bowls of ingredients on the island and gather around on stools. Ten-year-old Matt Hicks works on a puzzle in the living room. The coffee table is from Burlington-based Vermont Farm Table. Emily Pinney designed the built-ins in the den, where 15-year-old Ben works at a desk. A transom window above the cabinetry looks into the stairwell. It draws light into the room and allows family members to catch glimpses of one another as they travel up or down the stairs. Street artist Michael De Feo created the purple-and-orange flower painting on plywood that graces the stairwell. A mix of pillows on the window seat invites lounging. 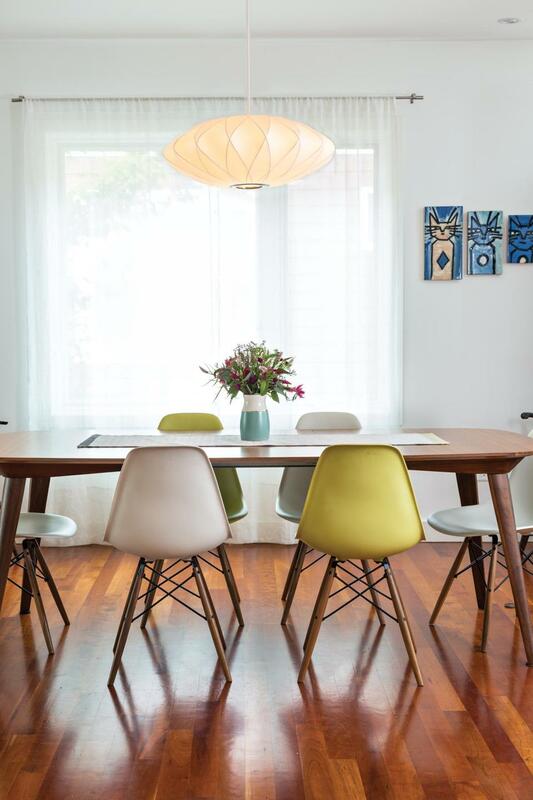 The new American cherry-wood flooring was chosen for its resemblance to the much pricier African walnut that Michelle and Cam Hicks originally had their eyes on. They own five “Gothic Kitties” paintings by local artist Dave Olson. The brightly colored landscape in the entry hall is by Michelle’s mother, local artist Priscilla Hayes. Marni Elyse Katz is a regular contributor to the Globe Magazine. Send comments to magazine@globe.com.